Once entered a fortress near the top level, intending to stealth-murder my way down. Here I am sitting in sneak mode in the doorway when I hear "I'll corve you into peeces!" down below. Sounds of Oakflesh being cast, swords being drawn, fireballs and explosions, and here comes Lydia running up the stairs with the entire goddamn fort in tow. 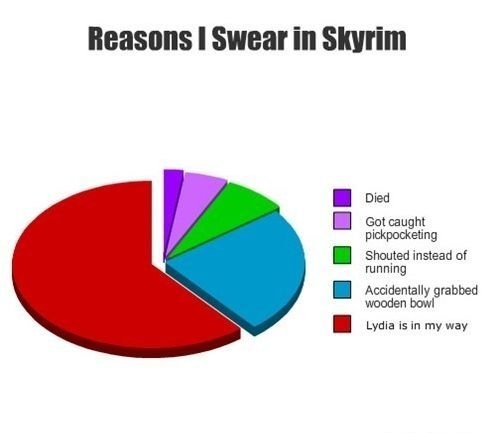 Well done, Lydia, but this isn't an MMO. You're not supposed to pull the trash with you! PenguinDJ, FWRonald and battmeghs like this. Not only that, but go into a small room or area and she stands in the door and you have to push her out of the way. The nerve of the girl. PenguinDJ, Kephras, 607 and 1 other person like this. PenguinDJ, marknaaijer, FWRonald and 4 others like this. I don't think Dovahkiin is supposed to mean "A dragon was literally my daddy." PenguinDJ, battmeghs and TheMiniKins like this. I think something has gone awry. Update: Someone forgot to open Helgen's doors. i don't know how i got this at the greatest time ever, but freaking AAAAAAA! 607 and Kephras like this. I snuffed out the issue I was having with the intro, and got it to work properly. Turns out Requiem was causing the game to bug out and turned many things topsy turvy... I'll admit it was a little ambitious to try and get the game to work with requiem as well as a slew of about 100 other mods. I don't believe I'm familiar with that one. Big quest mods in general though can be quite tricky to integrate. Requiem is a huge overhaul to add some fantasy elements to the game, as well as some new textures for housecarls, generals, and guards. honestly, I didn't know exactly everything that requiem added. I really only wanted it for the improved textures. "Stay close to the wall" He says. Alduin's made of hate and razor blades. He does not cuddle well. PenguinDJ and battmeghs like this. Nightingales don't murder I believe? So she would just be a thief.